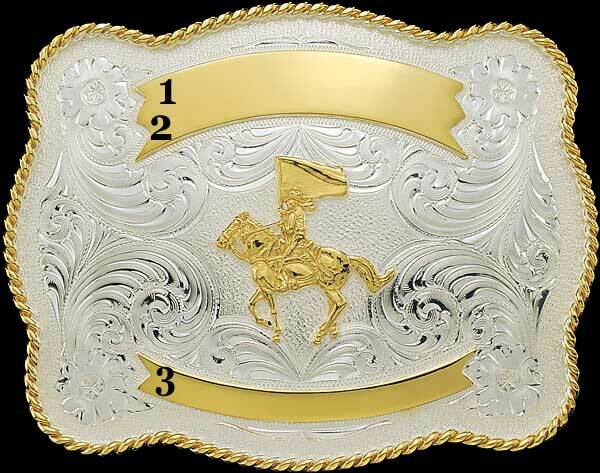 Montana Silversmiths custom belt buckle 3603. 3¼" x 4¼". Three engraveable ribbons and your choice of figures. Shown with Flag Bearer figure #F84. Finished in Montana Silversmiths famous Montana Armor, which will not tarnish or chip. This custom belt buckle is also available in solid sterling silver (usually price x 3); contact us for a quote. Download the Catalog of Figures here. This custom belt buckle is also available with an Antiqued Patina.